My 2 1/2 year old is a sensory-seeking SPD kiddo. He's constantly in motion and EXTREMELY physically active. He seems to be triggered by our dog, and many times they play very well together, chasing each other around and generally burning energy. Our son has started to get TOO physical when he gets over-excited, to the point of hitting, pulling ears/fur, jumping/falling on the dog. He's about twice the dog's size now, so I'm afraid of the dog getting hurt. I'm also afraid because the poor dog is starting to react to my son's aggression WITH aggression -- growling only so far, but I'm afraid that it could escalate. 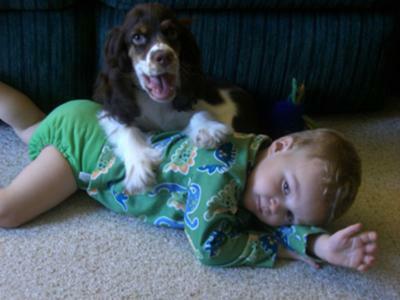 They are never left alone together, and I correct as soon as there is any issue, but if there is any way that I can get my son to be less aggressive towards the dog or to calm down in the dog's presence... HELP. My son really, really loves his puppy. Comments for Aggression towards dog? I also live in Madison and have a 3 year old son with SPD. We don't let him play with our dog because we don't trust them together. He gets mad at and aggressive toward our dog because the dog tries to eat his food all the time. My goal would be for my son to just ignore the dog and leave him alone. Have you learned any new ideas since you posted this comment? What resources in Madison have you found to be helpful? Thanks!